The Mosul dam has been a subject of international concern since Saddam insisted that it was built and numerous experts have raised concerns as to the threat that the dam poses to the hundreds of thousands of people who live downstream from it and to the stability of Iraq itself. ISISداعش are known to target dams as by taking a dam they can control the water supply to those that they are targeting or destroying a dam can have catastrophic consequences to those ISIS wants to subjugate. A simple internet search for Mosul dam will reveal the opportunity he represents to those wishing to gain power or to destroy opposition. A catastrophic failure of the largest dam in Iraq would send a wave 65ft high hurtling down the valley of the river Tigris, killing up to 500,000 people, US engineers warned yesterday. The dam, which is near Mosul in the north of the country, was built in 1984 on a bed of water-soluble rock and is in imminent danger of collapse. "In terms of the internal erosion potential of the foundation, Mosul Dam is the most dangerous dam in the world," said a report by the US Army Corps of Engineers. 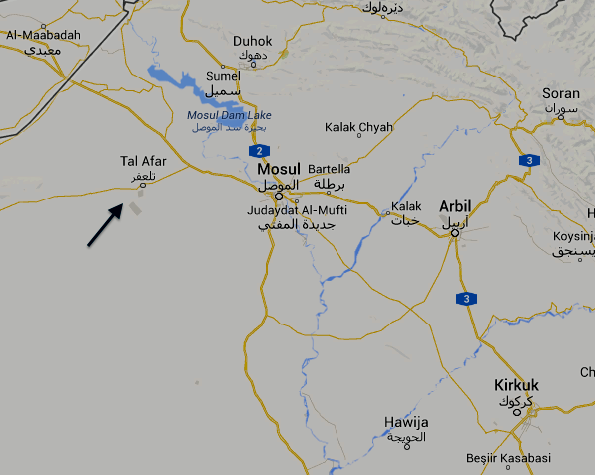 "If a small problem [at] Mosul dam occurs, failure is likely." The collapse of the two-mile long, earth-filled dam would release eight billion cubic metres of water in the lake behind it in a giant wave which would flood Mosul – a city of 1.7 million people 20 miles downstream – to a depth of 60ft. "A catastrophic failure of the Mosul Dam would result in flooding along the Tigris river all the way to Baghdad," the US military commander General David Petraeus and the US ambassador Ryan Crocker warned the Iraqi prime minister, Nouri al-Maliki, in a letter on 3 May this year. "Assuming a worst-case scenario, an instantaneous failure of Mosul Dam filled to its maximum operating level could result in a flood wave 20m deep at the city of Mosul, which would result in a significant loss of life and property." The frantic debate within the US and Iraqi governments over the failing dam was kept secret for months to avoid public panic and attracting the attention of insurgents. The US Army Corps of Engineers has tried to monitor the deterioration and undertake remedial action. The state of the dam and the experts' belief that it is on the verge of collapse was first revealed by The Independent on 8 August. "It could go at any minute," a senior aid worker, who knew of the struggle by American and Iraqi engineers to save the dam, told this newspaper. "The potential for disaster is very great." The Independent's story was confirmed yesterday with the release of a report by the US Special Inspector for Iraq Reconstruction, which said that the dam's foundations could give away at any moment. It spells out publicly the degree of alarm felt by the Corps of Engineers, which has directed that American military equipment on the Tigris flood plain should be moved to higher ground. The main problem is that the dam was "built in the wrong place", according to Khasro Goran, the deputy governor of Nineveh province, of which Mosul is the capital. Construction of the dam, initially known as the Saddam Dam, began in 1980 and was completed four years later when the lake behind it began to fill. "The dam was constructed on a foundation of marls, soluble gypsum, anhydrite and karstic limestone that is continuously dissolving," said a specialist at the US embassy in Baghdad. "The dissolution creates an increased risk of dam failure." The flat, Mesopotamian plain was the site of the biblical flood where Noah launched his ark to escape the rising waters. Much of the story was drawn from the legend of Gilgamesh, the ancient Mesopotamian hero, which recounts the tale of a great inundation with details strikingly similar to those in Genesis. 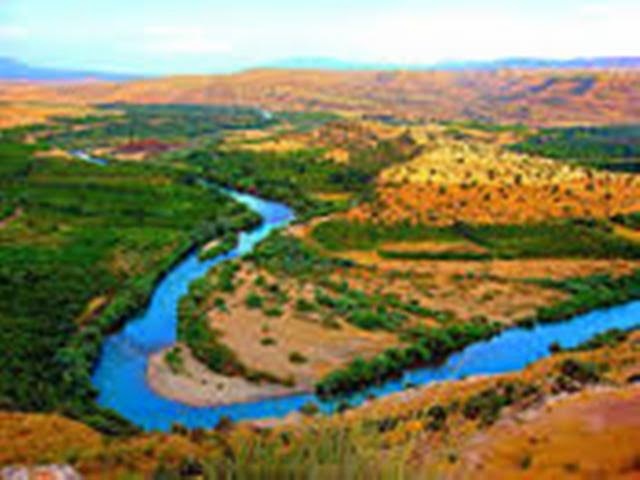 For millennia,Iraq was prone to floods as melting winter snows in the mountains of Turkey filled the Tigris and Euphrates rivers. In the 20th century, flooding was brought under control by an elaborate system of dams and dykes. But these would be unable to cope with the vast quantities of water which would be released if the Mosul Dam bursts. The Independent was first told of the impending disaster by a senior aid worker who feared that no one was doing much to prevent a disaster. "It is a time bomb waiting to go off," he said. "Everybody knows about the threat but they have other preoccupations and, in the case of foreigners, it is now conveniently in Iraqi hands." He added that some military radios issued to US personnel had panic buttons to press when the dam began to give way. The failings of the dam became clear soon after it was built and, since the late 1980s, the main method used to strengthen the foundations has been to pump liquid cement into them, or grouting. Since May this year, the water level in the reservoir behind the dam has been lowered on the advice of an international committee of experts appointed by the Iraqi Ministry of Water Resources, which is now responsible for the project. Cockburn makes reference to the concerns of both US and Iraqi authorities that the dam’s weakness would attract insurgents. Un fortunately the internet and other media sources have highlighted the problems associated with the dam and the threat its collapse poses. It is essential that the dam is protected and, in the absence of Iraqi ground forces, the peshmerga are the only forces that could do so. Saddam built the dam to try to curtail us by ensuring it does not fall to ISIS we will not only be safeguarding our border with Mosul and ISIS but taking a decisive act to safeguard countless Iraqi lives. Latif Rashid, theex minister in charge, continues to believe that disaster can be averted. But, if the dam does break, there is nothing to stop a 65ft wall of water drowning hundreds of thousands of people between Mosul and Baghdad. 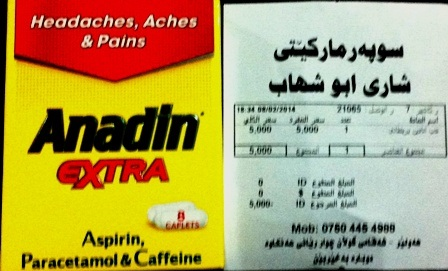 On Tuesday evening (3rd June) I went to shop in the Majdy shopping mall in Erbil. This complex has a hypermarket and many brand name outlets as well but I was shopping for food and household goods. Whenever, and wherever, I shop for food products I check the expiry date of the product, manufacture’s details and of course the price. I found that as usual the cost of food was inflated especially the cost of imported food products. Perhaps it is no surprise to know that in Kurdistan there is no organization that deals with consumer protection apart from the government’s checks with regard to the cleanliness of restaurants and the expiry dates of food and of course most of the food products on sale here are imported. When I went to the checkout there was only one young Kurdish boy working there and the rest of the staff were of Indian nationality and this prompted me to go through the checkout where the young Kurd was working and to ask a few questions. I simply asked him what was the ratio of Kurdish to non –kurds and foreign shoppers using the supermarket? He called to another Kurd working in the shop to come and answer the query. 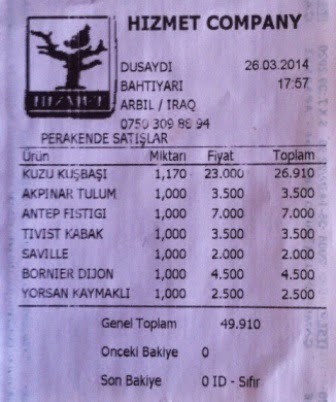 Between them they told me that only 4 out of every 10 customers are Kurds and the remainder from southern Iraq . They laughed and told me that the number of Kurds using the market had dropped because, as everyone knows, no salaries had been paid in Kurdistan for the last three months and only those from the south or elsewhere had money to spend. I went into several of the brand name outlets, such as Levi, Clarks and Adidas where I discovered that there was only one Kurdish salesman and the rest were from south Iraq. In addition theses people told me that only two out of ten of their customers are Kurds. The difference for these outlets is not only due to the fact that so many Kurds have not received a salary in recent months but that those who are rich enough go to Europe and elsewhere to obtain their goods. This lack of Kurdish shoppers is a direct result of the disruption to regular salary payments to so many Kurds over the last five months and another sector that reflects the result of this is the building trade. Since the beginning of 2014 the building sector has seen monthly trade drop to only 25% of last year’s figures. While the money in the pockets of so many is reduced daily the cost of food and other goods is raised by those out to make as a large a profit as possible. I was shocked to discover that the cost of a packet of Paracetemol tablets, made in the UK, is almost a three times more that it is in Britain. 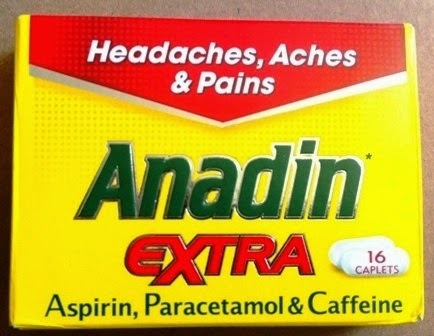 In the UK I buy packet of 16 Caplets ( capsules) Paracetemol for UK £1.50 but here in Kurdistan I must spend UK £2.50 to buy a packet of 8 capsules. I have lived in many developing countries and have never seen such an inflation of costs in a peaceful country. Here traders can obtain land for business use by simply going to the governmental authorities, taxes are low (if there are any), they do not have to meet insurance costs and readily employ the cheap labour of the poor from Nineveh, Syria and Iran so I wonder just how high their profits can be in a market that is just a free for all. There needs to be a consumer protection agency that monitors not only food quality but ensures that fair prices are charged for goods here. Around six years ago, when Mr. Adnan Mufti was Speaker of the KRG parliament, a law was about to pass to protect consumer rights but as yet nothing has been done to finalized this law. We desperately need action to be taken to enforce legal protection of consumers’ rights and, in addition, payment of long overdue salaries to stimulate the stagnant economy.